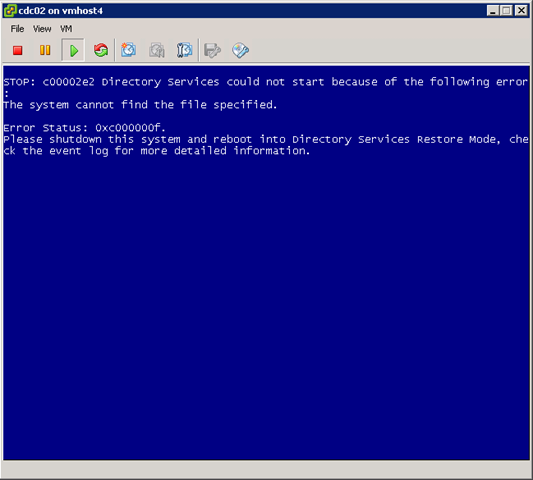 STOP: c00002e2 Directory Services could not start because of the following error: The system cannot find the file specified. Error Status: 0xc000000f. 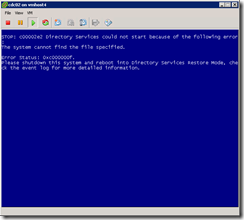 Please shutdown this system and reboot into Directory Services Restore Mode, check the event log for more detailed information. I consulted Google, and saw several posts mentioning problems with VMs when a virtual disk was unavailable. That reminded me that, in keeping with best practices, we had created separate volumes for some of our Directory Services files. I booted the machine into Directory Services Restore Mode. Looking at Disk Management, I saw that only the boot volume was online. I brought the other volume online and rebooted. No Windows stop messages, and then the system asked to reboot again to finish installing new hardware. Thank you for this article. After troubleshooting this issue, V2V Windows Server 2008 Hyper-V to ESX vSphere (using stand-alone converter), the issue was resolved in bringing disk1 and disk2 online. 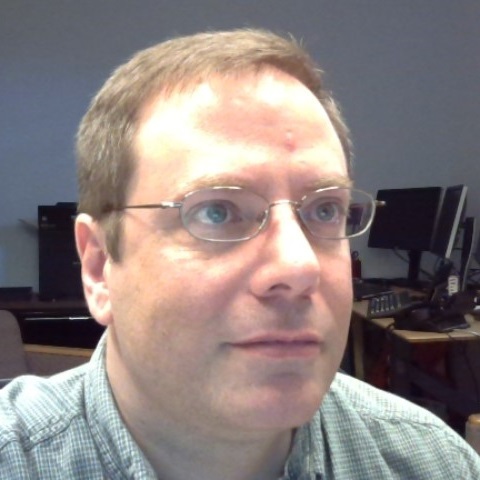 It was a late night working on this Domain Controller and a relief to have it migrated – thanks again – appreciated the insight.